An open patient appeal is being held at Lochgelly High School on Saturday, 12 November between 10am and 4pm for anyone between the ages of 16-30 and in good health. The Scottish Fire and Rescue Service have shown their commitment to saving lives by spearheading a new search to find a lifesaving hero for young Ava Stark. Three-year-old Ava desperately needs a stem cell donor after she lost out on a life-saving stem cell transplant for the second time in four months – after a donor who was a rare match was unable to donate, due to medical reasons, at the last moment. 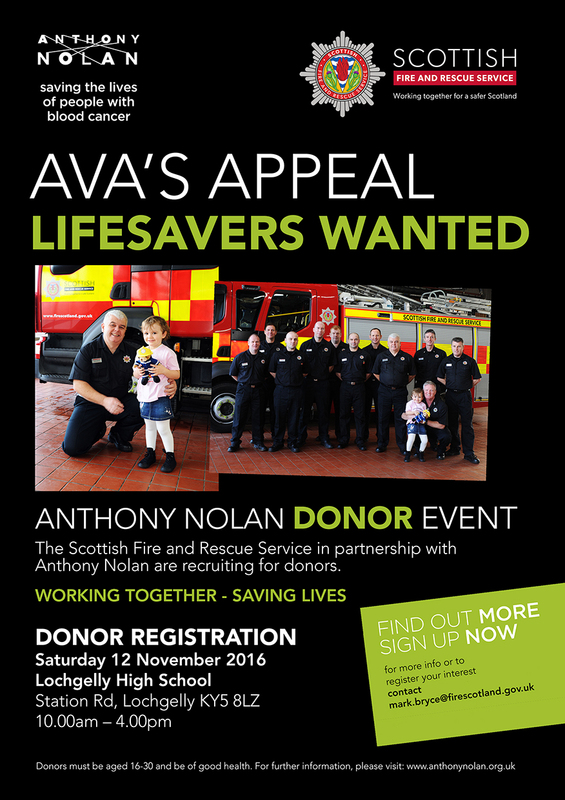 The Scottish Fire and Rescue Service (SFRS) have an award winning partnership with blood cancer charity Anthony Nolan and on hearing about Ava’s story they decided to get involved. Group Manager Andy Watt who chairs the partnership on behalf of the SFRS said: “As soon as we heard about Ava’s story we decided to see what we could do to help. Staff members from Ava’s local area immediately volunteered and are planning a series of events in the hope of finding a match for Ava”. The event is being led by Scottish Fire and Rescue Service Group Manager Mark Bryce. He said: “Our intention is to roll out our lifesaving Anthony Nolan school programme across Fife and we could think of no better place to start this than in Ava’s home town of Lochgelly.  “However, as well as giving school pupils the chance to join the register we have decided that in order to find Ava a new hero we would organize an open event in partnership with Lochgelly High School. “This event is open to any person in good health between the ages of 16 and 30. “We have had huge support in young females and we are asking for the young men to step up and come along and join the register. Anyone between the ages of 16-30 and in good health can come along on Saturday, 12 November to Lochgelly High School, Station Rd, Lochgelly KY5 8LZ and with the simple provision of a small saliva sample they can join the stem cell register and become one of Ava’s heroes. Ava’s mum Marie said: “We have been blown away with the support of the public and to hear that the fire service has offered their support means the world to us. 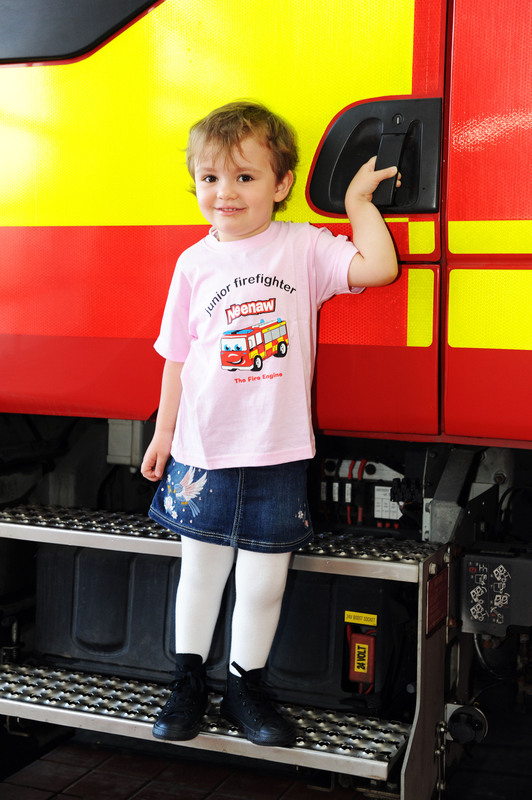 Ava had an amazing day with the firefighters and they told her they were determined to find a new hero for her. This event won’t just help Ava but could help hundreds of others now and in the future. So please if you fit the criteria come along and give a spit and help save my little girl”. Amy Bartlett, Regional Register Development Manager for Anthony Nolan has also praised the SFRS.